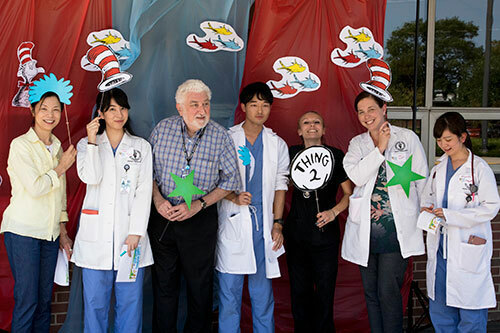 Seussville directional signs guide PVM faculty and staff as they arrive at Purdue Veterinary Medicine's "Hats Off to You!" appreciation event. 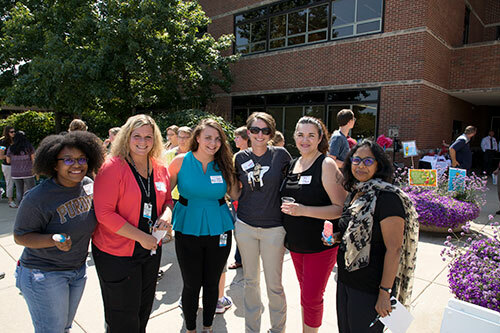 Purdue Veterinary Medicine faculty and staff were treated to a special "Hats Off to You!" 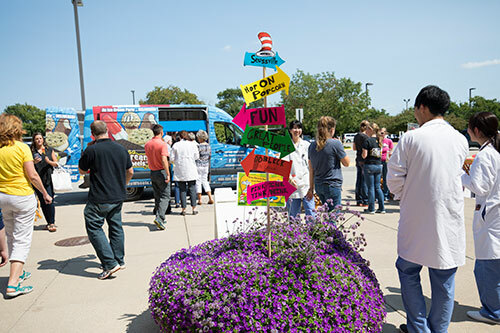 appreciation event last Friday, August 26, in "Seussville" outside Lynn Hall's east entrance. 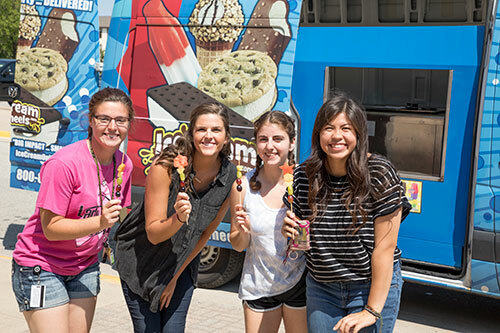 The annual appreciation event featured creative decorations, an appropriately styled photo booth, ice cream treats from Ice Cream on Wheels, popcorn, lemonade and an assortment of goodies any "Who" would enjoy! Beautiful weather provided the perfect setting as attendees carried out their assignment to learn the favorite places of their colleagues, who wrote them on their nametags. "Mountains," "Jamaica," "Home," and "Dog Park" were among the answers. Those who completed the assignment earned a free trip to the candy bar! Special thanks to Director of Alumni Relations and Special Events Susan Xioufaridou for masterminding the Dr. Seuss theme and coordinating the event, with the help of several Office of Engagement colleagues. And thanks to the fantastic group of dedicated individuals "Who" make up the PVM family! Fruit kabobs were among the treats "ripe for the picking" at the PVM faculty/staff appreciation event. With the help of some props, appreciation event attendees created a "picture-perfect" setting in PVM's own "Seussville!" PVM Associate Dean for Engagement Sandy San Miguel and Director of Alumni Relations and Special Events Susan Xioufaridou (right) greet appreciation event attendees. A warm, sunny day in "Seussville" helped to make for a super "Hats Off to You!" PVM faculty/staff appreciation event!